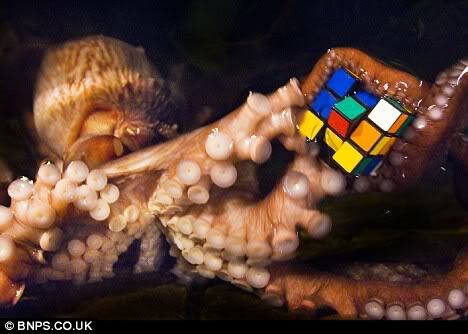 The organism possesses a cognitive representation of its environment (including the object we refer to as “Rubik’s cube”). The organism possesses curiosity — a behavioral disposition to manipulate the environment and observe the effects of manipulation. The organism has a cognitive framework encompassing the idea of cause and effect. The organism has desires and intentions. The organism has beliefs about the environment. The organism is conscious of itself within the environment. How would any of these hypotheses be evaluated? Here we seem to see the organism conveying a tool (coconut shell) to be used for an important purpose later (concealment) (link). This behavior seems to imply several cognitive states: recognition of the physical characteristics of the shell; recognition of the utility those characteristics may have in another setting; and a plan for concealment. The behavior also seems to imply a capacity for learning — adapting behavior by incorporating knowledge learned at an earlier time. Another tool available to the cephalapod theorist is controlled experimentation. It is possible to test the perceptual, cognitive, and motor capacities of the organism by designing simple experimental setups inviting various kinds of behavior. The researcher can ask “what-if” questions and frame experiments that serve to answer them — for example, what if the organism is separated from the shell but it remains in view; will the organism reaquire the shell? A third tool available to the cephalapod researcher is the accumulated neuro-physiology that is available for the species. How does the perceptual system work? What can we determine about the cognitive system embodied in the organism’s central nervous system? In short, it seems that cephalapod cognition is a research field that necessarily combines detailed empirical research with conceptual and theoretical framing; and the latter efforts require as much rigor as the former. « Are emergence and microfoundations contraries?